The future of the downtown may soon get brighter. A lot brighter, thanks to multi-colored LED lights under the railroad tracks, vibrant vintage neon art and murals that will cover entire windowless sides of buildings. “Beyond Walls” is the name of a project adopted by a volunteer group of Lynn residents, business owners and public art enthusiasts working together to reinvigorate the city’s downtown. U.S. Rep. Seth Moulton, Mayor Judith Flanagan Kennedy, city leaders and Lynn’s State House delegation support the project. The proposed lighted Central Square underpass. .MassDevelopment and Lynn’s Neighborhood Development Associates will announce today a new campaign through the civic crowdfunding platform Patronicity and the Commonwealth Places initiative. Beyond Walls will use funds raised from the campaign to install lighting in train underpasses and 12 neon artworks in the city’s business district, a sculpture that pays homage to Lynn’s industrial roots and 10 murals in the heart of Lynn’s Transformative Development Initiative District. If the campaign reaches its crowdfunding goal of $50,000 by May 22 at midnight, the project will win a matching grant with funds from MassDevelopment’s Commonwealth Places program. 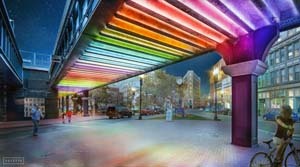 “This campaign to change the public perception of Lynn through colorful lighting, murals and public art will illuminate the city’s rich cultural history and spur new business and economic activities,” said MassDevelopment President and CEO Marty Jones. “Investing in this revitalization of Lynn’s Central Square is really the first step in bringing the city back to a position as a leader,” said Al Wilson, founder and executive director of Beyond Walls. Wilson and Amanda Hill of RAW Art Works, associate director of the “Placemaking” group, said the mission is twofold: to use culture and art to improve the quality of life for the benefit of those who work or live in the city; and to have millennials view Lynn as a viable alternative to living in South Boston, Allston, Cambridge or other traditionally attractive neighborhoods for young professionals. “Placemaking” is a multi-faceted approach to the planning, design and management of public spaces. It capitalizes on a local community’s assets, inspiration and potential, with the intention of creating public spaces that cater to and attract people. “This brings the community together. This project will make Lynn a destination,” added Hill. A local benefactor has donated 12 neon artworks. Street artists will be selected to create 10 murals and the GE I-A, the first jet engine manufactured in Lynn, has been donated to the project and will likely be displayed in front of the viaducts on Mount Vernon Street, across from the LynnArts building. Some of the world’s top mural artists, including Shepard Fairey, who created the Barack Obama “Hope Poster,” have expressed interest in using Lynn’s architecturally-exciting buildings as blank canvases, said Wilson. Fairey has his eye on 545 Washington St., which he saw during a visit to Lynn two years ago. Wilson said he was inspired by Wynwood Walls in greater Miami that was once a run-down, neglected industrial section of the city and is now an arts and cultural mecca. “It is filled with cool cafes, restaurants and market-rate housing for millennials and empty-nesters,” he said. Boston-based Payette architects sent its senior managers to tour the city, and, Wilson said, “They were blown away. They saw beauty in the architecture and tall buildings.” He called Payette’s Parke MacDowell an unsung hero to “Beyond Walls.” Payette and Cambridge-based lighting design firm LAM Partners have offered their services at no charge. Wilson and Hill praised the enthusiasm and work of Charles Gaeta, the Neighborhood Development Associates executive director, who has been a receptive, supportive, mentoring partner. If an additional $30,000 can be raised above the $50,000 goal, the project will be expanded to include the installation of three more murals, five more vintage neon artworks and the potential lighting of the Washington Street underpass. Installations would occur in June and July. Learn more and donate at www.patronicity.com/ynn. A “Beyond Walls” fundraising party will be held at Lynn Museum, 590 Washington St., Lynn, the evening of April 6, 6-10 p.m. Lynn-based Bent Water Brewing and Short Path Distillery of Everett will provide adult beverages, and several area restaurants (The Blue Ox, Eastern Harvest Foods/Lynn Meatland, Old Tyme Italian Cuisine, Brother’s Deli, Tacos Lupita) will provide food. There will be music and celebrity bartenders. A video of the project will be shown at 8 p.m.
Al Wilson, founder and executive director of “Beyond Walls,” said there is no admission charge to attend the party, but a tax-deductible donation of $20 or more is suggested. One hundred percent of donations will go toward project costs. Bill Brotherton is the Item’s Features editor. He can be reached at bbrotherton@itemlive.com.